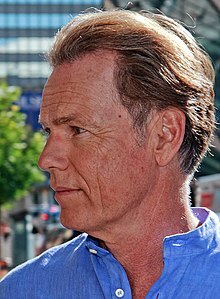 Stuart Bruce Greenwood is a Canadian actor and producer. He is generally known for his roles as U.S. presidents in Thirteen Days and National Treasure: Book of Secrets, Ben Stevenson in Mao's Last Dancer and for his role as Captain Christopher Pike in the 2009 Star Trek film and its sequel Star Trek Into Darkness. In television, Greenwood starred as Gil Garcetti in The People v. O. J. Simpson: American Crime Story, and has appeared in Mad Men, St. Elsewhere, Knots Landing and John from Cincinnati. Stuart Bruce Greenwood (born August 12, 1956) is a Canadian actor and producer. He is generally known for his roles as U.S. presidents in Thirteen Days and National Treasure: Book of Secrets, Ben Stevenson in Mao's Last Dancer and for his role as Captain Christopher Pike in the 2009 Star Trek film and its sequel Star Trek Into Darkness. In television, Greenwood starred as Gil Garcetti in The People v. O. J. Simpson: American Crime Story, and has appeared in Mad Men, St. Elsewhere, Knots Landing and John from Cincinnati. He has appeared in supporting roles in such films as Hollywood Homicide, Double Jeopardy, Déjà Vu, I, Robot, Dinner for Schmucks, Capote, and as the motion capture alien dubbed "Cooper" in Super 8. Greenwood is also a voice actor; his voice roles include Chiron in the Canadian animated series Class of the Titans and Bruce Wayne / Batman in Batman: Under the Red Hood and Young Justice.